With the help of an online community, a nerdy and socially awkward man gathers the courage to start dating an attractive lady he met on a train. 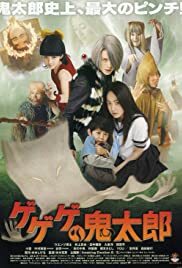 I saw the "Kitaro Millennium Curse" (2008) before seeing this one, so I have a little different impression of this movie than everyone else. Gegege no Kitaro is a fun movie that brings Kitaro story to the big screen. The characters are remarkably real, and believable. Usage of CG to show Ittan Momen (Flying cloth) was a nice touch. The movie was little rough at the edges as it was the first attempt to bring Kitaro into live action movie (This improves a lot on the Millennium Curse). The story tried to tell too much. There's the Yokai kingdom with Oo Tengu as the judge, there's Kitaro's friends Neko Musume, Konaki Jiji, Sunakake Babaa, Nurikabe, and Ittan Momen, and then there's love story between Kitaro and the girl. Things got little bit confusing, and the characters didn't get enough time of the day on each of their parts. But the movie was fun to watch, and entertaining. I really liked the rendition of Kitaro in this movie. It could have been a real cheese, but it wasn't. The movie is recommended as is its sequel. A nice Yokai movie from Japan.